The Reformer Martin Luther (1483–1546) is remembered for many great achievements, including translating the Bible into German in 1545. Many of his words are also remembered, and often quoted. It turns out though that some sayings attributed to him today were not actually said by him at all. The following famous quote attributed to Dr Martin Luther, widely used by creationists, turns out not to be by him at all. This “battle quote”, and its attribution to Martin Luther, appears widely in Christian literature. It has mostly been used by specifically creationist writers—including CMI—though by no means exclusively. For example, it is cited in full, as “Martin Luther said … ” in the book The Great Evangelical Disaster, by renowned evangelical philosopher and writer, Dr Francis Schaeffer.1 In turn, many reference Schaeffer, who gives no primary reference, as their source for the quote. Even though Martin Luther said many similar things, these are not his words. However, we were able to obtain a copy of the pages of Martin Luther’s writing in question (kindly supplied by a supporter, Dr Péter Szentpétery). When I read them in the original German (my mother tongue), it was clear, even allowing for the loosest of loose translations, that this could not be the source. There were some similar sentiments, but quite differently worded. Luther was encouraging believers to speak up in the face of opposition. He was exhorting them on the basis of Christ’s words in Matthew 10:33 (“Whoever acknowledges me before men, I will also acknowledge him before my Father in heaven. But whoever disowns me before men, I will disown him before my Father in heaven”) and other Scriptures not to remain silent in public on something they believed to be true. In particular (here is where it gets most similar), his thrust was that even if they were publicly open about just about every other aspect of their Christian faith, but chose to not admit their belief on some single point of doctrine (for fear of what might happen to them if their conviction on that one point became known) they were effectively denying Christ, period. While it’s obviously got similar overtones, there is nothing in this section that could be remotely translated into the wording of the “battle quote”—no mention of battles or soldiers, even. So where did it come from? The research of a Pastor Mark Henderson indicates that it comes from a 19th Century novel by Elizabeth Rundle Charles,2 called The Chronicles of the Schoenberg Cotta Family (Thomas Nelson, 1864). Its author was a pious Anglican who was also the writer of a few hymns. The novel is set in a real historical framework of actual persons and events, but the main characters and storyline are fictional. The words of the “battle quote” in the novel are attributed to a fictional character in the book called Fritz, in a long section detailing his relationship to Luther and the Reformation. The section is reproduced below, up to and including the quote itself, placed (by us) in bold font. Fritz’s Story. Ebernberg, April 2nd, 1526. A chasm has opened between me and my monastic life. I have been in the prison, and in the prison have I received at last, in full, my emancipation. The ties I dreaded impatiently to break have been broken for me, and I am a monk no longer. I could not but speak to my brethren in the convent of the glad tidings which had brought me such joy. It is as impossible for Christian life not to diffuse itself as that living water should not flow, or that flames should not rise. Gradually a little band of Christ’s freedmen gathered around me. At first I did not speak to them much of Dr. Luther’s writings. My purpose was to show them that Dr. Luther’s doctrine was not his own, but God’s. But the time came when Dr. Luther’s name was on every lip. The bull of excommunication went forth against him from the Vatican. His name was branded as that of the vilest of heretics by every adherent of the Pope. In many churches, especially those of the Dominicans, the people were summoned by the great bells to a solemn service of anathema, where the whole of the priests, gathered at the altar in the darkened building, pronounced the terrible words of doom, and then, flinging down their blazing torches extinguished them on the stone pavement, as hope, they said, was extinguished by the anathema for the soul of the accursed. At one of these sendees I was accidentally present. And mine was not the only heart which glowed with burning indignation to hear that worthy name linked with those of apostates and heretics, and held up to universal execration. But, perhaps, in no heart there did it enkindle such a fire as in mine. Because I knew the source from which those curses came, how lightly, how carelessly those firebrands were flung; not fiercely, by the fanaticism of blinded consciences, but daintily and deliberately, by cruel, reckless hands, as a matter of diplomacy and policy, by those who cared themselves neither for God’s curse nor his blessing. And I knew also the heart which they were meant to wound; how loyal, how tender, how true; how slowly, and with what pain Dr. Luther had learned to believe the idols of his youth a lie; with what a wrench, when the choice at last had to be made between the word of God and the voice of the Church, he had clung to the Bible, and let the hopes, and trust, and friendships of earlier days be torn from him; what anguish that separation still cost him; how willingly, as a humble little child, at the sacrifice of anything but truth and human souls, he would have flung himself again on the bosom of that Church to which, in his fervent youth, he had offered up all that makes life dear. "They curse, but bless Thou." The words came unbidden into my heart, and almost unconsciously from my lips. Around me I heard more than one "Amen;" but at the same time I became aware that I was watched by malignant eyes. After the publication of the excommunication, they publicly burned the writings of Dr. Luther in the great square. Mainz was the first city in Germany where this indignity was offered him. Mournfully I returned to my convent. In the cloisters of our Order the opinions concerning Luther are much divided. The writings of St. Augustine have kept the truth alive in many hearts amongst us; and besides this, there is the natural bias to one of our own order, and the party opposition to the Dominicans, Tetzel and Eck, Dr. Luther’s enemies. Probably there are few Augustinian convents in which there are not two opposite parties in reference to Dr. Luther. In speaking of the great truths, of God freely justifying the sinner because Christ died, (the Judge acquitting because the Judge himself had suffered for the guilty), I had endeavoured to trace them, as I have said, beyond all human words to their divine authority. But now to confess Luther seemed to me to have become identical with confessing Christ. It is the truth which is assailed in any age which tests our fidelity. It is to confess we are called, not merely to profess. If I profess, with the loudest voice and the clearest exposition, every portion of the truth of God except precisely that little point which the world and the devil are at that moment attacking, I am not confessing Christ, however boldly I may be professing Christianity. Where the battle rages the loyalty of the soldier is proved; and to be steady on all the battle-field besides is mere flight and disgrace to him if he flinches at that one point. The novel’s author may have modelled the comment by her character on such statements by Luther. As indicated earlier, Luther is known to have expressed some similar “don’t flinch on even one point, or you may as well have flinched at the lot” types of sentiments, as confirmed by my reading of at least that one section in his correspondence. 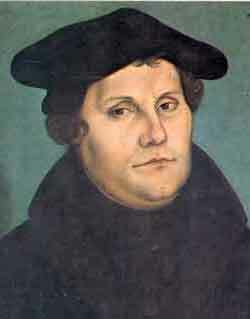 Pastor Henderson suggests that the novel’s author, who would have likely been familiar with at least some of Luther’s writing as background for her historical novel, may have modelled the comment by her character on such statements by Luther. This could help explain why the citation has been so readily accepted as authentic. This famous “battle” passage remains very relevant to the whole creation-evolution debate within the church today. But it’s important that it be attributed to the correct source.4 Even though there is a “Luther connection”, and even though Martin Luther said many similar things, these are not his words. Many thanks to all the parties named herein as having helped research this question, including provision of the actual text from the novel in question. Crossway Books, pp. 50–51, 1984 Return to text. Having lived for decades in and around Adelaide, the capital of South Australia, I was intrigued to find that the author was the daughter of John Rundle, after whom Adelaide’s famous Rundle Mall is named. Return to text. Concordia Journal 35(4):356–359, 2009. Return to text. Given the obvious downside in substituting “Martin Luther said … ” with the somewhat less ennobling “Fritz said … ”, most using the quote henceforth will likely prefer to simply reference the novel and its author. Return to text.